Best in Show! Saturday’s Best in Show was filmed by Animal Planet for an April airing. Just sitting in the stands was excruciating from the heat given off by all the lights. I can’t imagine what it was like in the ring for the dogs and the handlers! By the time the Toy Group came out, I wasn’t sure if I was going to pass out from dehydration or not. 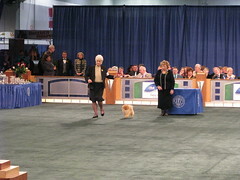 Geri Arnold’s Pomeranian won her group so she is going to be on TV. Geri is the epitome of a class act. Observing her in the ring, she is always so professional and gracious no matter how her dog places. Unfortunately, her Pom did not win, but she is a winner in my book! And I always feel like the Pug never gets enough attention, but I am partial so what can I say?! Moonstruck’s Smarty Pants “Prada”. Prada is such a little doll baby! She was being handled by Geri Arnold for the show. And I was amazed at how she transformed from being a 20 month old playful pug outside the ring to a well behaved show contender at the end of the lead for Geri! She did have a couple of moments where Geri would have to correct her, but I think that she did great in the ring. She had some stiff competition too. But really what I loved about Prada is how at the end of the conformation events, she and I would hang out in the hotel room and snooze! She was my best friend, until her sister Mia showed up and I was cast aside! I really wanted to bring her back with me! She placed all but one day in the show and I think that she has a bright future. 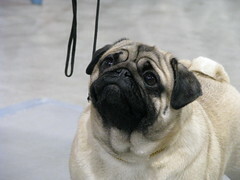 We woke up bright and early to get us and the pugs ready for the show & agility competition. 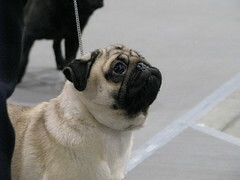 I was so freakin’ excited about getting to the Expo Center and setting all the pugs that I could not stand it! I was also pretty excited/nervous/thrilled to use my Canon Powershot S5 camera (since I came home with crappy pictures last year)! We got to the ring and got settled. 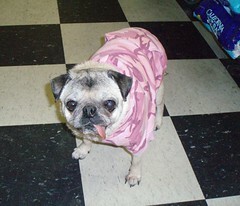 I introduced myself to Carla Rose of Rose Pugs, Jade Hall of Smugpugs, and Anne Benson of Anmar Pugs all of whom are on Pugvillage.com. It is so great to actually see and talk to people who you know from an on-line group. By the time that all the pugs had shown, I’d taken 187 photos! Can you believe that? I did some experimenting with the multiple shot setting and it was okay, but the zoom was fantastic, I think that I got some good pug pictures! 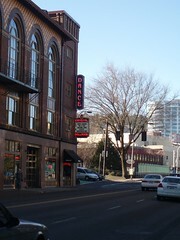 The first Saturday of each month is designated as Chattanooga Pug’s Play Date. Since January is historically yucky weather, we have our pug gathering at Bone Appétit located at 103 Frazier Ave, Chattanooga, TN. The owners, Kathy & Joan, are always so gracious to let us come invade their store for a couple of hours with a bunch of snorting pugs! Also, they are so generous and have fresh baked treats available for our babies. This year, I decided to take Baby Girl since she has only been to one other pug meet up and has never been to Bone Appétit. I admit, I was running a little late to get there, but I did take Baby Girl outside to potty before we left the house. 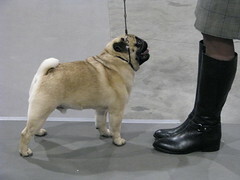 There were only 4 other pugs there, which was a low turn out, but good so that BG did not get too excited. She and Pippa greeted each other and were off to explore the store and all the new smells. They have tons of doggie treats and the most adorable gift items. Well, inevitably, Baby Girl took the biggest poop right in the store! Luckily, it was towards the back of the shop and I could quickly scoop it up. I am sure I was about 8 shades of red from embarrassment! Then Baby Girl proceeded to pee pee on a cat toy at the front of the store! Needless to say, I was completely embarrassed at this point. I borrowed some paper towels to clean up out little piddle, but I felt compelled to buy the toy that my pug had just pee’d on. I am not sure what I am going to do with a cat toy since we have all dogs, but thankfully, it was on sale! (Maybe I can give it to my Mom’s cats and they won’t notice?) It is kind of a funny story, but one that I hope we don’t repeat again! We appreciate everyone at Bone Appétit for their support for our Pug Meet Up so please visit them and get your canine friend some yummy treats! You are currently browsing the papaspugs.com Blog blog archives for January, 2009.